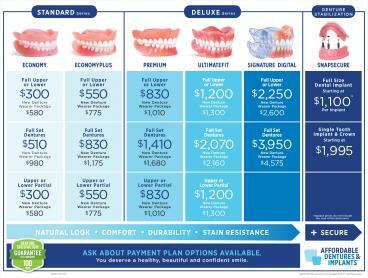 Find dentures and implants tailored to your comfort at Affordable Dentures & Implants®. We're pleased to be a trusted local office of America's largest denture provider in Wichita, KS. Whether you're coming to us for new dentures, denture repairs, or implants, an experienced dentist will help you find the best possible solution for your unique needs. From initial examinations and preparations to fittings and adjustments, we do things right while maintaining affordable fees. Highly experienced technicians at our on-site dental lab have crafted thousands of dentures and implants. We'll help you change your life in as little as one day with our same-day service and efficient processes. We also offer same-day crowns at our office and, for your added peace of mind, sedation dentistry. Treat yourself to a beautiful, healthy smile. Compassionate care given with dignity and respect is what you can expect from the staff at Affordable Dentures & Implants in Wichita. We have convenient office hours and also meet the needs of patients from Ponca City, Newton Anthony, Dodge City, and the surrounding areas. Call today to get more information on our dental services and to set up your appointment. Our practice is independently owned and operated by Don Nguyen, DMD, FICOI, FAAIP. Dr. Nguyen and his caring staff offer a wide range of denture and implant solutions. Patients are welcomed into a comfortable and modern setting where their options are clearly explained and services customized to their individual needs. As a graduate of Boston University Henry M. Goldman School of Dental Medicine where he earned his Doctor of Dental Medicine degree, Dr. Nguyen is committed to patient satisfaction.